Arianespace has successfully launched two satellites: Star One D1 for Embratel Star One, and JCSAT-15 for SKY Perfect JSAT Corporation. The launch took place on December 21, 2016 at 5:30 p.m. (local time) from the Guiana Space Center, Europe’s Spaceport in Kourou, French Guiana. This was the 11th and final launch of the year for Arianespace, the seventh with Ariane 5 in 2016, as well as the heavy-lift launcher’s 76th consecutive success and its 90th launch overall. With this launch for Brazil and Japan, Arianespace confirms its position as the benchmark launch service provider in Latin America and Asia. Star One D1 is the 11th satellite to be orbited by Arianespace for Embratel Star One, the largest satellite operator in Latin America. The previous launch for this operator was Star One C4, orbited in July 2015. Star One D1 is the initial fourth-generation satellite for the Brazilian operator, and is to provide broadband telecommunications, Internet access and other digital applications for Latin America, Central America and the Caribbean. Star One D1 is the largest satellite built to date for Embratel Star One. Arianespace and Embratel Star One have teamed up successfully for the last 30 years. All Embratel Star One satellites have been launched by Arianespace. JCSAT-15 is the 19th SKY Perfect JSAT satellite assigned to Arianespace to launch, and follows the orbiting of JCSAT-13 in May 2012. With a fleet of 17 satellites, SKY Perfect JSAT is the largest commercial satellite operator in Asia. It provides satellite communications and pay-TV broadcasting services and delivers a broad range of entertainment through the SKY PerfecTV! platform, the largest service of this type in Japan with some 3 million subscribers. JCSAT-15 will offer communications services for Japan, including broadcasting, data transfers, and maritime and aeronautical applications for the Oceania and Indian Ocean regions. Arianespace has operated in Japan for 30 years now, launching a total of 28 satellites for operators in the country. Two more Japanese satellites are included in its order book. Arianespace is celebrating its 30th anniversary in Japan, since the opening of its Tokyo office in 1986. Arianespace has launched one Japanese satellite per year on average since 1989. Arianespace holds more than 70% of the Japanese market open to competition for the launching of geostationary-orbit satellites. Today’s launch is the second Arianespace mission of the year to carry two SSL satellites on an Ariane 5, following the Flight VA230 mission in June. For the latest launch, Flight VA234’s two satellites were built in SSL’s Palo Alto, California facility using SSL 1300 platforms, which are perfectly adapted to the Arianespace launcher family and enables optimized management during launch campaigns in French Guiana. Since the launch of Intelsat 5F.7 on October 19, 1983, Arianespace and SSL have developed a very fruitful partnership. Star One D1 and JCSAT-15 are the 62nd and 63rd SSL satellites launched by Arianespace. 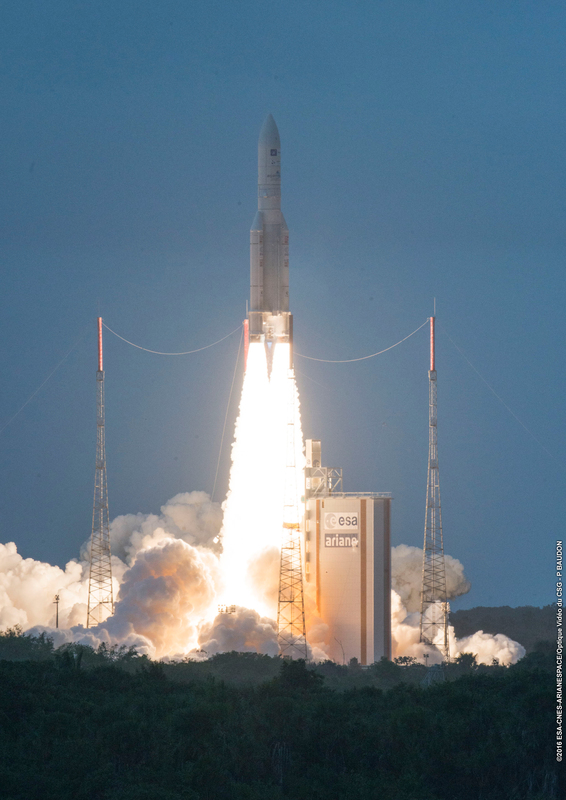 In 2016 alone, Arianespace launched 11 SSL satellites: EUTELSAT 65 West A, EchoStar 18, BRISat, Intelsat 36, four SkySats, Sky Muster II, Star One D1 and JCSAT 15. Two more SSL satellites will be launched soon: Azerspace-2/Intelsat-38 and BSAT-4a. 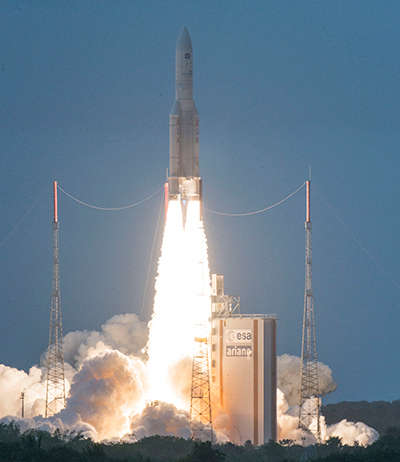 With this last launch of the year, Arianespace maintains a sustained pace of operations. It carried out 11 launches during 2016, all successful, using its entire family of launchers: seven by Ariane 5, two with Soyuz and two by Vega. Arianespace also set a new record by orbiting 27 satellites during the year (versus the previous record of 25 satellites in 2012). Total mass injected into orbit in 2016 was 61.4 metric tons, including 52.4 metric tons into geostationary transfer orbit. Shortly after the announcement of the orbital injection of the two satellites, Stéphane Israël, Chairman and CEO of Arianespace, said: “With this seventh Ariane 5 success of the year, and the 76th success in a row for our heavy-lift launcher, Arianespace is proud to share the excellence of its launch services with our Brazilian and Japanese customers. We are honored by the ongoing trust of the Brazilian operator Embratel Star One, for whom we have launched all satellites since 1985, and the confidence expressed by Japanese operator Sky Perfect JSAT, for which we have now launched 19 satellites. I would also like to thank our long-standing partner SSL, which, for the second time this year, built both of the satellites lofted by our Ariane 5 launcher. “I would like to thank all our partners who contributed to this 90th Ariane 5 launch: Airbus Safran Launchers and the entire European launcher industry for the reliability and availability of Ariane 5; the European Space Agency for their unshakeable support for the Ariane program; CNES/CSG, along with our ground segment companies and all staff at the space center, who continue to work alongside us as we go from success to success; and of course congratulations to everybody at Arianespace for the success of this 11th and final launch of the year. We’re now looking ahead to 2017 for another year at the service of our customers”. Star One D1 was built by SSL (Space Systems Loral) in Palo Alto, California using an SSL 1300 platform. With a liftoff mass of 6,433 kg., and offers a design life exceeding 15 years. To be positioned at 84° West, it is fitted with 70 Ka-, C- and Ku-band transponders. It will cover Brazil, Latin America (West), Mexico, Central America and the Caribbean. JCSAT-15 was built by SSL (Space Systems Loral) using an SSL 1300 platform, in Palo Alto, California. It had a mass at liftoff of approximately 3,400 kg. and offers a design life of 15 years. Positioned at 110° East, it will replace N-SAT-110, launched in 2000, and will cover Japan, Oceania and the Indian Ocean region.